This is a climb that starts either by the Lauerzersee (449m) to the east or in Goldau (496m) to the west on the north side of the Rigi mountain. The climb really starts after reaching Bernerhöhe (556m). After where the two roads meet at Bernerhöhe (562m) the climb is 11.32 km long for 1235 height metres at 11.0% on average, and it is thus a quite steep climb and all climbs with more than 10% on average for over 10 km are clearly among the select little group of the hardest climbs in the Alps. This climb has added problems to the steepness: it is irregularly steep and much steeper toward the end and the road is narrow at first as it climbs up the steep mountain side (it is a bit hard looking at the map to understand why they could not more easily have built a road elsewhere, but the mountain is very steep on the south side and other alternatives would be longer and perhaps not much easier. This is not all as the asphalt runs out as the road evens out as it reaches a first crossing with the railway also going up the mountain (on both sides even), but it looked like there was maybe some asphalt under the gravel to me and it is an easy stretch to the Klösterli train station. From Rigi Klösterli (1302m) where there are some asphalt again one could (as I somewhat stupidly did) climb up to Rigi First (Firstgatter) (1454m), but even though I know the road normal suggested on my map here is quite steep ahead with up to 20%, this road was still likely steeper (I barely got up a first ramp with concrete strips for the wheels, then negotiated a little gravel, but before reaching a new concrete ramp I had to give up and the concrete ramp was filled with stones and again at least 20%). The normal road ahead is nearly all concrete and terribly steep but it is possible to climb. 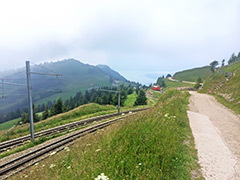 From the Rigi Staffel station (1605m) by the mountain ridge where you again cross the train line (best to go off as it is very nasty to cycle over here), it is quite steep up to the top of the mountain on a wobbly narrow concrete road with many walkers on a fine day. From the restaurant before the top you could cycle straight up to the top on a yet steeper (but better) asphalt ramp or take the easier longer road up there. I did the part from Rigi Staffel as I came up here from the Rigi Staffelhöhe (1557m). Other comments This is a very, very hard climb and probably not possible if it is wet. You are in fine weather greeted with fantastic views though. My views were not as impressive as I had some low hanging clouds hovering just at the peak height, but still great. There are many tourists up here coming up with the trains and a road bike is an unusual sight up here. I went down the road on the south side from Rigi Kaltbad, but guess the people working and living up there would not quite know what I am talking about. The road down there is not paved and should be difficult with a mountain bike (a downhill bike would be best) it is above 25% down on a very loose track. I had to walk for more than 1 hour down via Felsentor (a cool passage for walkers) and cycled maybe 200m before reaching asphalt again.